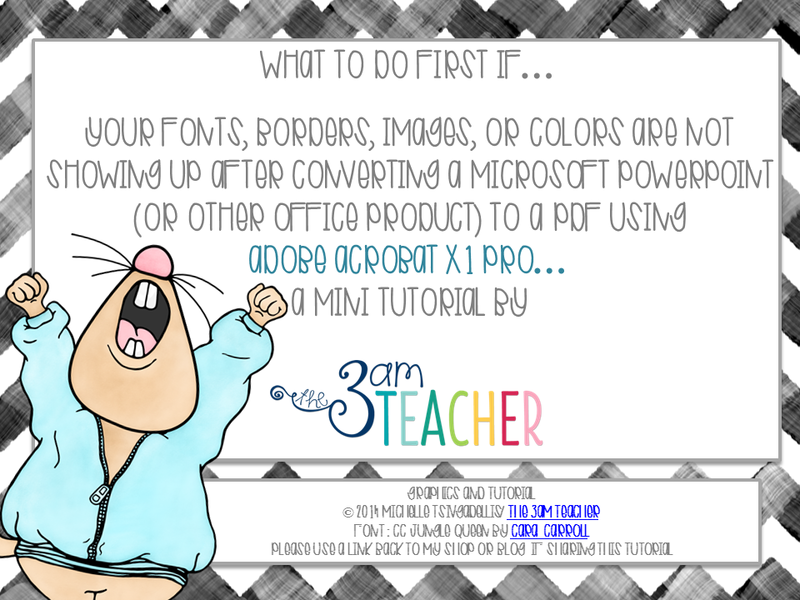 The 3am Teacher: Converting a PowerPoint to PDF Using Adobe Acrobat X1 Pro Issues: This FREE tutorial Might Help!! Converting a PowerPoint to PDF Using Adobe Acrobat X1 Pro Issues: This FREE tutorial Might Help!! I have a sweet(and short) little tutorial that might be of help to some of you out there. I continued to get questions from people who were having some issues with font styles, text, or text frames not showing up after they converted a Microsoft PowerPoint document to a PDF using Adobe Acrobat X1 Pro. I decided to create a tutorial for those of you who might be experiencing this issue. Although this tutorial has helped most, it will not solve all converting problems. You MUST own Adobe Acrobat X-X1 Pro for this tutorial. Please be aware that I am using a PC, so if you own a MAC computer, the instructions might be a little different from the ones in this tutorial. The newer versions of Adobe Acrobat Pro include a default setting that has caused many using the program hours of frustration. Follow the steps in this tutorial to disable this default setting to try and solve the issue you are having. If you have an older version of Adobe Acrobat Pro, this tutorial might work for you if you accidentally or unknowingly enabled the accessibility and reflow setting in preferences. I hope this is helpful!! If it is, please make sure to leave feedback and try to include the issue you were experiencing. Yes, this is very helpful for us.